I don’t know what’s really going on in Haints Stay. I had a vague idea what haints are, a sort of spirit typically found in New Orleans. So I thought from the get-go that the characters in Haints Stay were really ghosts wondering around in a confused recently dead state of mind. They kind of act that way. There is one major character, the boy, who has no memory. That neither of the other two major characters seem to know what’s going on adds to this lost sense of confusion that pervaded the novel, for me at least. No one seems to know what’s really going on. Just what is Mr. Winnette up to. No good, I think. The two main characters, Sugar and Brooke, are two brothers, hired killers wandering from town to town in America’s wild west, which made me think the book was going to be like The Sisters Brothers which is about two brothers who are killers in the old west. I loved The Sisters Brothers by the way. Sugar and Brooke kill far more people than the Sister Brothers do, by the way. An entire town full at one point. But the overall lack of any sense of real setting and my understanding of the title made me think they were all actually ghosts like the characters in Robert Coover’s western Ghost Town. I didn’t really care for Ghost Town. Sugar and Brooke just want to take a few days off from being hired killers when a local man discovers who they are and that Sugar is really a woman. He discovers this when the two brothers try to enter the bath at a local bath house. The two brothers are so far lost in the fiction that they are brothers that they are surprised by the stares Sugar gets when he disrobes to enter the water. The two “brothers” are then run out of the town they just arrived in with nothing but what they can grab on their way out of the bath house. They soon find the boy wondering naked in the surrounding woods. He tags along with Sugar and Brooke for a while. Eventually the three of them are separated and the story starts to get confusing. I don’t know if I liked it, though I can say I liked it enough to read it through to the end. I don’t know what’s really going on in it. Maybe the overall circular nature of the plot which does end just about where it began geographically and maybe chronologically has something to do with the nature of haints, which it turns out are ghosts or lost souls. Haints stay where and as they please. But that could just mean they are lost souls, which the really are, not that they are ghosts. If they are dead then it’s a very vague sort of afterlife Mr. Winnette’s characters are living, maybe an afterlife they are living while still alive, wondering through a hazy landscape that never really quite takes on a full form. 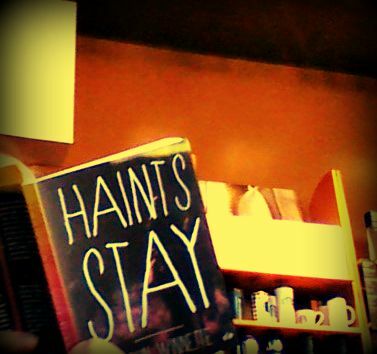 Haints Stay counts as book number 18 in the twenty books of summer reading challenge. Summer is just about officially over leaving me two books shy of completing the challenge. I blame Hanya Yanagihara. Previous Previous post: Sunday Salon: It’s Going to a Scorcher. Too Hot to Work or Too Hot to Read?